Matcha Tea is a type of green tea from Japan. It is made by grinding the green tea leaves into a fine powder. 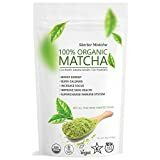 This powder is then blended with hot water to produce a bright green, frothy beverage that has a naturally sweet, rich flavor. 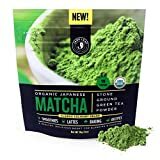 The caffeine content is for 1 teaspoon (2 grams) of Matcha powder dissolved in 8oz of water. The caffeine content can vary slightly depending on the type and quality of Matcha used. 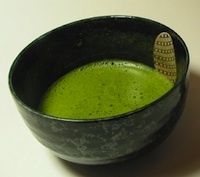 Koicha (thick Matcha) is prepared using the double amount of Matcha powder so it would have twice the caffeine. Matcha tea is high in antioxidants due to the fact that the whole leaves are being consumed and not just brewed. 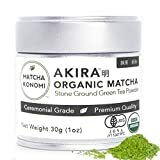 Matcha must be kept in a tin, airtight container as oxygen can quickly cause it to degrade. Matcha green tea powder is also used in other products such as green tea ice cream and other desserts. In the west, Matcha is finding its way into coffee houses where they use the powder in lattes, smoothies and other drinks. How Does Matcha Tea Compare? 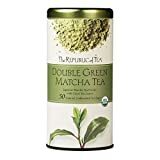 Matcha Tea contains 8.75 mgs of caffeine per fluid ounce (29.59mg/100 ml).